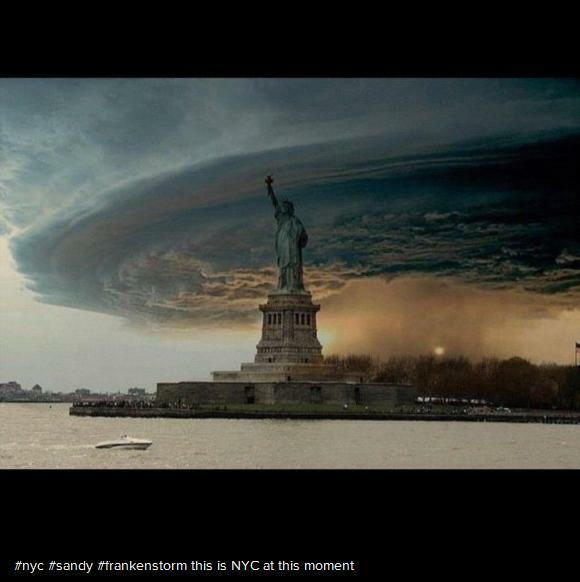 This photograph claims to show Hurricane Sandy over New York City’s Statute of Liberty, as viewed on October 29, 2012. However, this is a poorly photoshopped mosaic of a stunning photograph of a midwest supercell thunderstorm placed behind a separate photograph of Lady Liberty. Thanks to reader Julia for passing this one along, showing the Statute of Liberty, as seen in the movie The Day After Tomorrow – a computer-generated image. 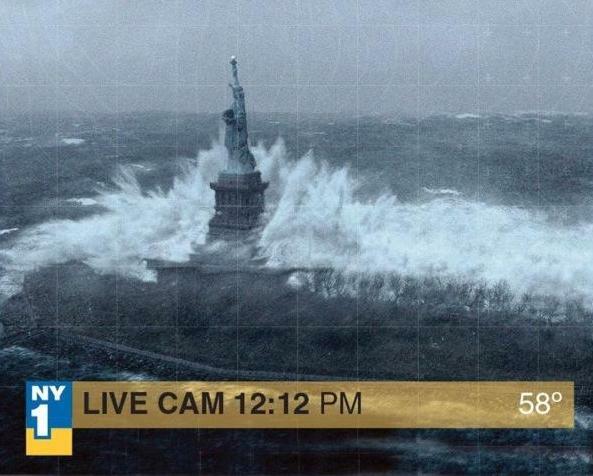 This photograph of the Statute of Liberty was actually a hollywood creation for the movie “Day After Tomorrow” – not a live cam from Sandy’s waves on October 29, 2012, as claimed in social media posts. Another such photograph is this one of Times Square in New York City. The photo is circulating today and claims to show a deserted Times Square in the wake of Hurricane Sandy’s arrival. However, this photo was taken months ago during a brief period in which the city closed Times Square for a hollywood movie shoot. 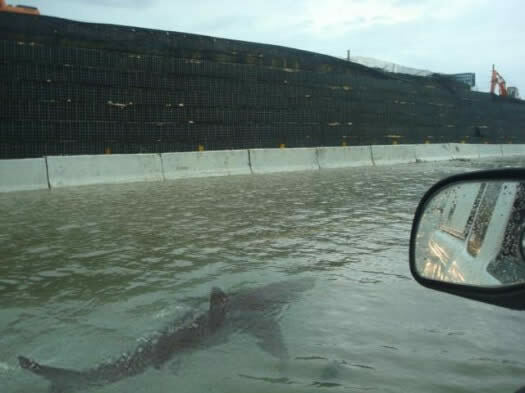 Another wild photograph purports to show a shark swimming alongside a car on a coastal highway on the East Coast in the wake of Sandy. A side-by-side comparison reveals the source photograph for the shark photograph. Further south, photographs are circulating of the Washington DC area as well. Though not photoshopped, this image is being circulated as showing the rains of Sandy, though the photograph was taken more than a month earlier. This photograph of the Tomb of the Unknown Soldier was taken earlier in September of 2012, not on October 29, 2012 during the rains of Sandy, as purported by many spreading the photograph recently through social media. Have you seen questionable photos? Add a link to the comment section and we’ll review the accuracy of each one. This article will be updated as new photographs emerge. 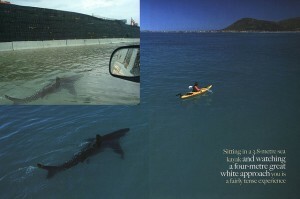 This photo being passed around (http://t.co/4W0GoHXc) is actually from “The Day After Tomorrow”. Thanks for that link, Julia – I’ve added that photograph to the article. I have a feeling this is just the beginning. 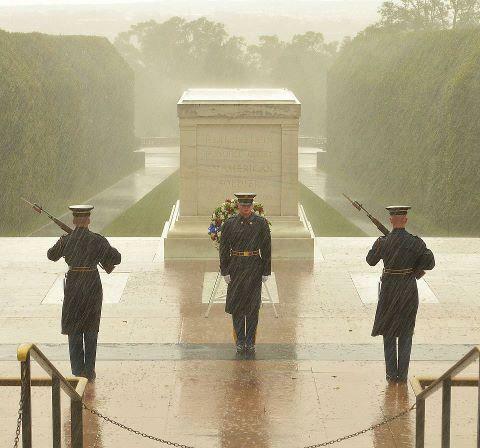 I’ve seen the share with the Tomb of the Unknown Soldier and it actually *does* state that the image is not from Hurricane Sandy but from a previous storm and that the soldiers would be on watch at the Tomb, as they were in previous events of severe weather. you have odds those tips much more legitimate from then on.